Everyone I know makes rumballs at Christmas time. And everyone has a different recipe. This one is cheap, quick and kid friendly, hence why they are called Coconut Chocolate Balls instead of rum balls. And while you could eat these at any time of the year, we seem to only ever have them at Christmas time. Crush one packet of plain biscuits and mix with 3 tablespoons cocoa powder, 1/2 cup of desiccated coconut and 1/2 teaspoon of vanilla. Add the gooey goodness of 1 tin of condensed milk. Set aside the unscrapped tin and see note below 😉 Mix well so that everything is sticking together, then get messy and roll mixture into balls. We make “big” adult balls and smaller kids bite size balls. Roll each ball in desiccated coconut and pop a few in your mouth and the rest into a container. I like to use a sheet of baking paper in between each layer so they don’t stick together. Put the container full of whatever you have left in the fridge to enjoy while they last. You might like to add 130g of chopped sultanas to yours. Or perhaps 30ml of rum. Or maybe you make yours with cake instead of biscuits? And now for the special naughty bit when you are done. Brew a coffee, whether you like espresso, stovetop or instant it doesn’t matter. Swish the coffee in your almost empty tin of condensed milk before pouring it into your coffee mug and top with milk. I don’t usually add sugar to my coffee but this is sweet and delicious for a special treat. It makes awesome iced coffee too if you want to wizz it up with cold milk and ice. 4 Responses to "Coconut Chocolate Balls"
What do you mean by biscuts? Can you take a picture of the package? Hi Lexie, I’m Australian so biscuits means a crispy cake, like a cookie I suppose. 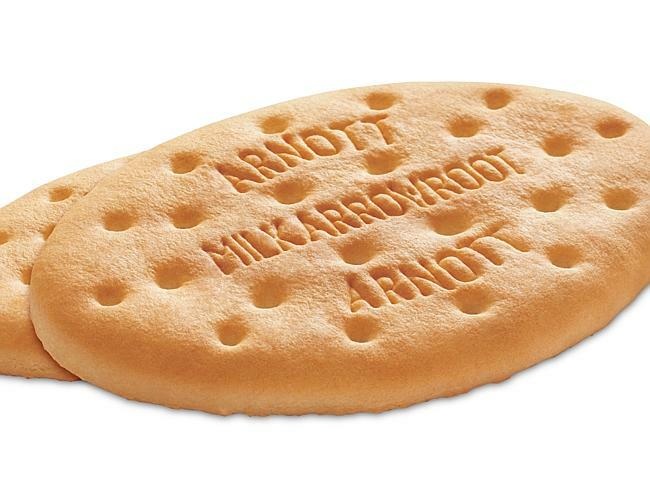 We generally use Arnotts arrowroots or similar for this sort of recipe.